Have you had your existential crisis for the day? If not, that’s what I’m here for. Fermilab, the Illinois-based particle physics laboratory, has recently built a machine to test the Holographic Principle: that our universe is a two-dimensional hologram. Now before you have the wrong kind of existential crisis, this is not to be confused with the Simulated Universe Hypothesis: that our universe is a computer simulation. When non-scientists hear the word “hologram” they tend to think of something completely different than what a physicist might think of. 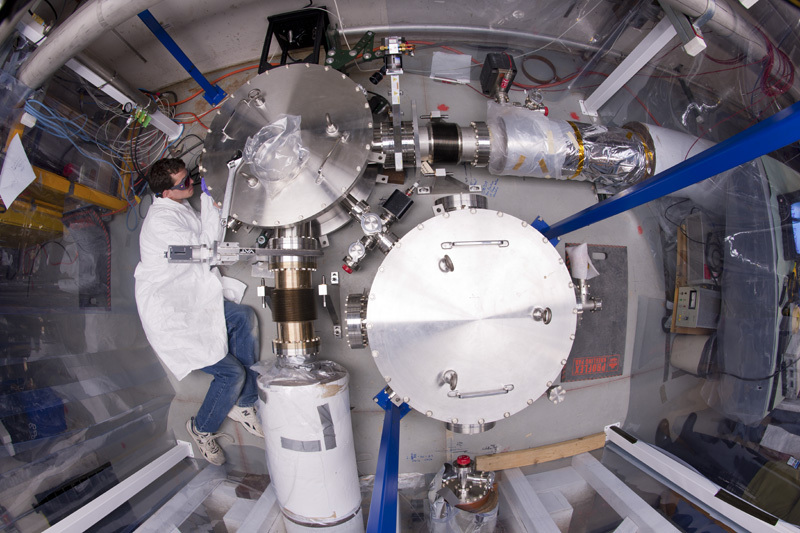 Top view of the Holometer as a Fermilab scientist works on the apparatus. The Holometer uses twin laser interferometers to look for “holographic noise” in space-time, and will test whether the universe is a 2-D hologram. Credit: Fermilab. The holographic principle is a part of string theory, and it’s a realm of physics far too complicated to be explained in one article. Regardless, let’s back up and try to understand the holographic principle. I will stress again that this is not a hologram the Star Wars way you may be thinking of. Basically, the universe can hypothetically be described in two dimensions at the smallest level, whereas three dimensions only applies to a macroscopic universe. Fermilab described their experiment as looking for pixelation on a television screen. They’re trying to figure out how the universe stores information. The holographic principle was first proposed by Gerard ‘t Hooft, and Fermilab’s Holometer (the device they’ve built for this experiment) will be the first experimental observation of such phenomenon. Those are the words of Fermilab’s Craig Hogan. Though the principle might not be as reality shattering as it sounds, the experiment still plays an important role in understanding the fundamental nature of the universe. The experiment will take place over the next year.